Omnisphere will be Spectrasonics' new flagship synth. 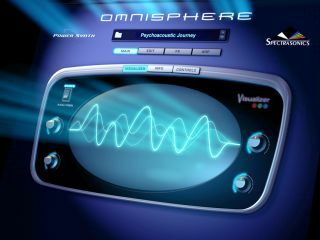 The most talked about software release at NAMM 2008 is Spectrasonics' Omnisphere. The successor to the company's ageing Atmosphere plug-in, this is a 'power synth' that we're told has been in development for many years. Omnisphere is the first product to be built around Spectrasonics' new STEAM Engine and incorporates a wide variety of synthesis techniques. These include variable waveshaping, DSP synthesis, granular synthesis and FM synthesis. High resolution sample playback is also on offer, as is polyphonic ring modulation, a dual multimode filter structure, a flexible modulation routing system known as Flex-Mod, an advanced unison mode and what Spectrasonics is calling its 'Chaos Envelopes'. Other notable features include Groove Lock integration with Spectrasonics' Stylus RMX, Live and Stack modes and modulatable FX Racks. Despite its beefy spec sheet, though, we're assured that, in use, the software is as simple or complex as you need it to be. Omnisphere will ship with a massive core sample library and thousands of patches. In fact, we're told that it's ten times the size of Atmosphere. There's plenty to get excited about, then - we were treated to a demo of Omni sphere and it certainly looks and sounds pretty special - but you'll have to wait until September 15 2008 to get your hands on it. The software is cross-platform and supports the VST, Audio Units and RTAS plug-in formats, while the price has been set at $499. You can keep checking the Spectrasonics website for the latest development updates in the months leading up to Omnisphere's release.